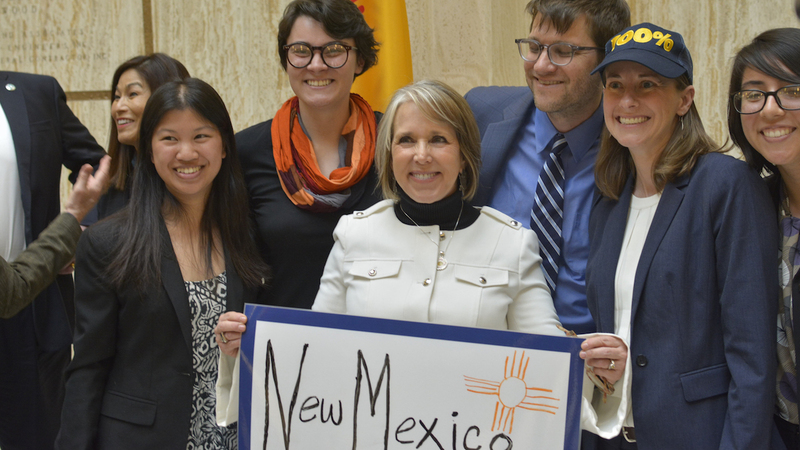 Our national network's New Mexico staff just helped their state become the third in the country to commit to a future powered by renewable and carbon-free energy. On March 22, Gov. Michelle Lujan Grisham signed the Energy Transition Act, SB 489, into law. The act sets new standards requiring New Mexico utilities to get at least 50 percent of their electricity from renewable sources by 2030 and to be 100 percent carbon-free by 2045. The Senate and House passed the Energy Transition Act with bipartisan support. "New Mexico is setting a prime example for how states can take the mantle of leadership, and momentum is building nationwide," said Rob Sargent, senior director of our national network's campaign for 100% Renewable Energy. "From Minnesota and Illinois in the heartland to Washington, Massachusetts and Florida on the coasts, several states are currently considering 100 percent bills." New Mexico follows California and Hawaii in committing to 100 percent renewable and carbon-free electricity.